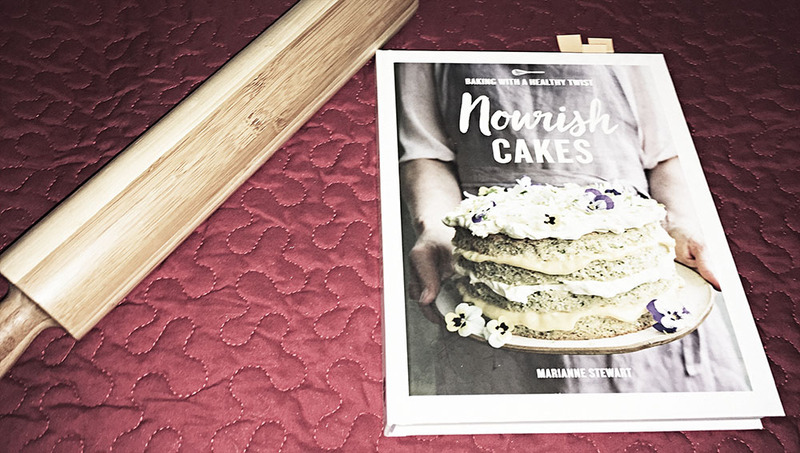 For everyone curious about going, or who needs to go, gluten-free, dairy-free, or any other kind of free, Marianne Stewart’s Nourish Cakes would make for a great resource. Filled with 50 recipes, all checked by nutritionist Rebecca Hiscutt, and accompanied by beautiful photography from Catherine Frawley, this should definitely be on your “to read” list. Stewart started baking because she’s always loved treats. Her goal, with these recipes, is to provide sweet treats that let home bakers indulge without the “bad-for-you” ingredients. This comes through nicely just by looking at the ingredients listed on most of the recipes. Many are familiar, but not necessarily what you would expect to have in a cake (or any other sweet treat). Think sweet potato, zucchini, beetroot, butternut squash… and others. I love the idea of eating cake that is packed with nutrients, rather than carbs. Nourish Cakes starts with a section called “Baking Basics”. This includes tips for how to make the perfect treat. For example: read through the whole recipe; weigh ingredients. It also has tips for how best to make gluten-free recipes, and the tools to use. The recipes themselves are separated into four flavour profile categories: Light & Zesty, Vibrant & Fruity, Warm & Nutty, Dark & Spicy. (The Lemon & Earl Grey Cake recipe below is found in the Light & Zesty section.) The final section is a list of basic recipes; these are used throughout the book. This is quite a nice way to save space and efficiently share recipes that use pie pastry, cheesecakes, pastry cream, and more. A feature I really liked was the Ingredient Index towards the back. In it, Stewart explains all the (perhaps) unfamiliar ingredients and why they make for good baking – for example “Sugars: Nutritionally, there is not a huge difference between different sugars, but choosing less refined versions and sticking with natural, rather than artificial, sweeteners will be better for your health and the environment.” Then a list of lists different sugars as well as details on how they may affect or change the flavour of the recipe. Each recipe starts with an intro paragraph – a sneak peak into why Stewart created it. These little tidbits are nice little insights into the author and recipes. Under the recipe title are acronyms for the dietary needs met by the recipe. This way it is easy to ensure you follow your ingredient needs, or those of your guests. Some recipes include variations, and others tips for how to make the perfect treat. This recipe is a twist on the classic lemon loaf cake, updated to include one of my favourite teas, Earl Grey. When I was living in Paris, I fell in love with the Mariage Frères teas. My favourite was their Earl Grey French Blue, into which they add dried blue cornflowers. It seemed only appropriate, therefore, to add some edible blue cornflowers to the decoration! Empty the contents of the tea bag into a bowl with the sugar, cover and infuse for a few hours or overnight if possible. Then grind in a blender until fine. Place the courgette (zucchini) between some kitchen paper to drain off the excess moisture. Place 80 g (3 oz) swede (rutabaga) and 80 g (3 oz) of the courgette into a bowl and sprinkle over the lemon juice and zest. Set aside. In a bowl, whisk together the eggs, sugar and oil for 5 minutes, or until pale and slightly thickened. Fold in the grated vegetables. Sift together the ground almonds, flour, raising agents and xanthan gum, if using. Fold into the cake mixture gently, until it is lump free. Preheat the oven to 180°C/fan 160°C/350°F. Grease 6 mini loaf tins, about 9 x 6cm (3½ x 2½in), with coconut oil and line with baking parchment or disposable loaf cases. Fill the tins almost to the top with the mixture and bake in the top half of the oven for 30 minutes, or until the tops spring back and an inserted cocktail stick comes out clean. Cool the cakes in the tins until just warm, then turn out onto a wire rack to cool completely. For disposable cases, just cool in the cases. Sift the icing (confectioners’) sugar into a bowl and add the lemon juice and enough tea to form an icing the thickness of double (heavy) cream. Pour the icing over the cooled cakes, and top with a little sprinkle of tea leaves and blue cornflowers, if you have them.